Sense of humour, self-irony and optimism have accompanied Stephen Hawking’s highly successful life and tragic illness. 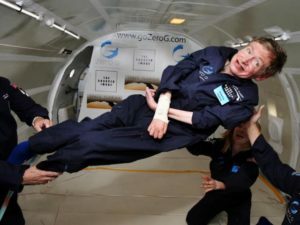 Stephen Hawking, the renowned physicist and cosmologist who recently died of ALS, was not only one of the brightest minds of the last century, but an optimistic man with a great sense of humour and self-irony, too. – Intelligence is the ability to adapt to change. – Not only does God play dice, but… he sometimes throws them where they cannot be seen. – The great enemy of knowledge is not ignorance, it is the illusion of knowledge. – People won’t have time for you if you are always angry or complaining. – One of the basic rules of the universe is that nothing is perfect. Perfection simply doesn’t exist… without imperfection, neither you nor I would exist. – I have noticed even people who claim everything is predestined, and that we can do nothing to change it, look before they cross the road. – The downside of my celebrity is that I cannot go anywhere in the world without being recognized. It is not enough for me to wear dark sunglasses and a wig. The wheelchair gives me away. – We are just an advanced breed of monkeys on a minor planet of a very average star. But we can understand the Universe. That makes us something very special. – My goal is simple. It is a complete understanding of the universe, why it is as it is and why it exists at all. – Women. They are a complete mystery. – People who boast about their IQ are losers. – Life would be tragic if it weren’t funny. – Remember to look up at the stars and not down at your feet. Try to make sense of what you see and wonder about what makes the Universe exist. Be curious. And however difficult life may seem, there is always something you can do and succeed at. It matters that you don’t just give up.